Sorry, we are currently sold out of 'Panama Mama Cata Geisha Lot 55'. Please check back later. We have offered coffee from the Mama Cata Estate in the past, most notably a Typica-Geisha blend from the To�a plot. This pure Geisha varietal is old school green tip, very floral, very sweet and competely delicious. Only a tiny amount is up for grabs. We are also separately offering Lot 57 which has minimal yet slightly distinctive flavor attributes. What is the difference in these two lots: 2 days. Lot 55 was harvested on February 24th, the 55th day of the year and Lot 57 two days later on the 26th. The Mama Cata Estate was purchased in 1997 by Jose David Garrido Perez, who revamped the farm's existing technology in an effort to modernize the growing process. 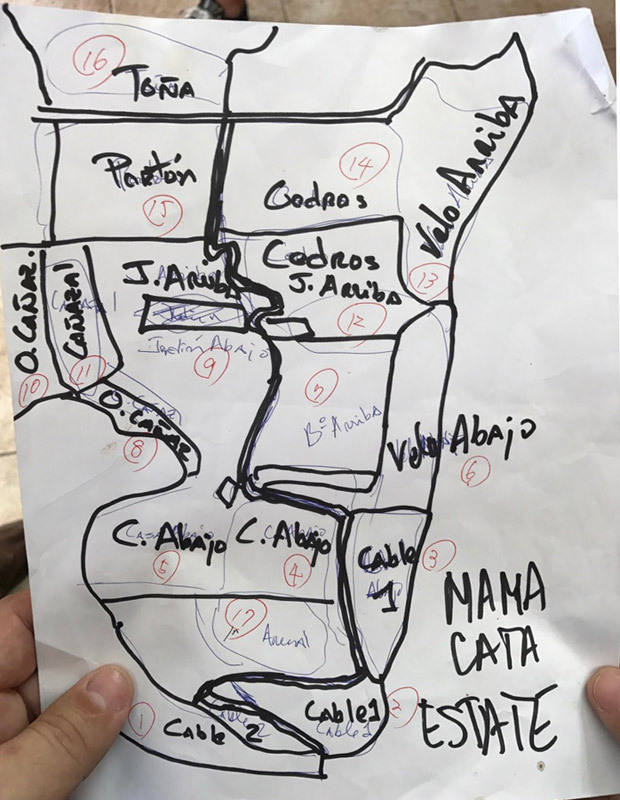 Coffee lots are identified by GPS coordinates, which allows the Garrido Perez family to study soil composition, varietal and individual tree output in a given lot. From this information they are able to tailor each harvest to produce the best quality and output of coffee cherry possible. There is also a major focus on harvesting only the ripest cherries, and pickers are educated on proper ripeness, rather than just picking all the cherry off a given tree. Patio drying of the coffee is done with attention to weather patterns, which are monitored by high-tech weather stations located at the wetmill. 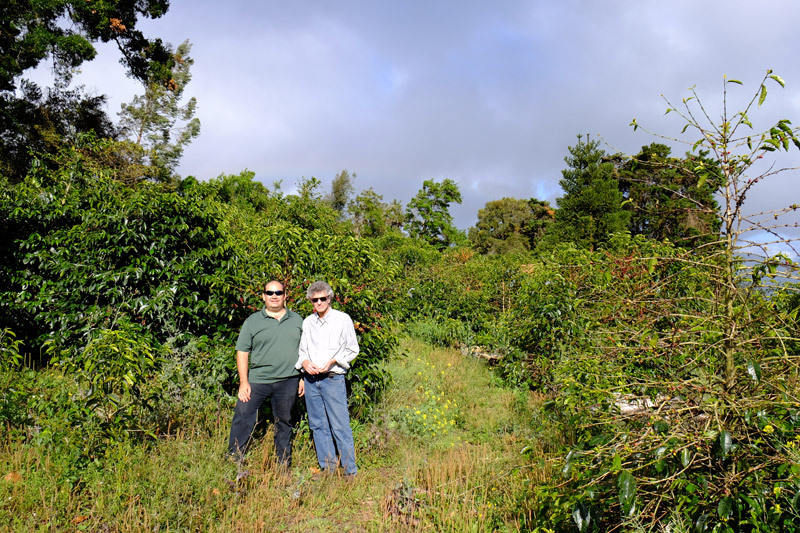 Prior to the Garrido Perez family buying the land, the farm was owned by the Fisher family, where they focused on traditional coffee varietals, like Typica. It is from the matriarch of the family, Catalina Fisher, that the farm was given the name "Mama Cata". This lot is 100% geisha, an heirloom varietal from Ethiopia that produces a blue-green elongated coffee bean that is especially aromatic and floral. Price Peterson, who owns Hacienda Esmeralda in Panama, experimented by planting it some years ago along with a broader group of varietals. The result was the rediscovery of a great cultivar with extreme fruitiness and floral scents and flavors, but with balance and finesse not seen in other coffees. Coffee farmers in other countries soon followed suit, and the varietal regularly takes home awards in Cup of Excellence competitions held throughout the world. It is fully washed, meaning the outer skin and pulp (fruit surrounding the coffee husk) are totally removed during milling before being sun dried on patios. Cup Characteristics: Sweet and floral, with flavors of apricots and strawberries. Jasmine aroma. Roasting Notes: There is a balance when roasting geisha coffees; the roast has to be light enough to not mask geisha's delicate floral notes, but at the same time if the coffee is too lightly roasted it will lack body which will be apparent in the cup and the color of the brew. The balance seems to be attained by letting first crack fully finish and at that point killing the heat source and allowing the beans to develop. The development time may be a little shorter than for other coffees but these are the general guidelines. You will know you got it right when you savor a beautifully perfumed cup with light, but substantial body. Arabica Introduced: Arabica was imported from Costa Rica in 1820. Specialty Coffee Regions: Boquete near Volcan Baru, Chiriqui. Grades: Strictly Hard Bean (SHB), HB. Botanical Varietals: Typica, Caturra, Gesha. Panama is a rising star in the specialty coffee world. In the Boquete in particular, farmers are taking Arabica coffee cultivation to new levels and recent auctions of small, specialty lots have garnered record, if not silly, prices. Nonetheless, some of the coffee is excellent. Gesha, a varietal that stems from Ethiopia, has been grown here with good success, yet other cultivars noted above, can produce superb results.